Easter always makes me think of Heaven. And, now, Heaven makes me think of my Emma. She has been with me today as I shopped for Easter basket stuff, ironed clothes, and made baskets. She was with us as we celebrated her daddy's 40th birthday and watched her little sister hunt her first Easter eggs. She is here, in our hearts. 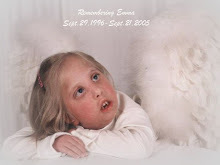 Easter makes me think of Heaven, and of my Emma. But, thankfully, Easter makes me think of my Savior. His love. His grace. His sacrifice. His forgiveness. His resurrection. Though I feel sad that my Emma is not here to celebrate with us on this earth, I am so grateful that because of Him she is alive and well in Heaven. She is praising Him with a beautiful dance and a lovely song I am sure. I may not hold her in my arms anymore, but I hold her in my heart always. She will ALWAYS be in our hearts. Love You Guys and Miss you So Much! Emma will always be in the hearts of those who knew and loved her.